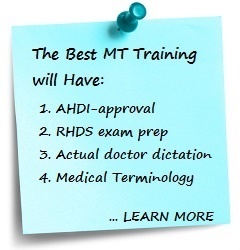 Best Medical Transcription Training- Your guide for finding the best MT training! Welcome to Best Medical Transcription Training.com, your guide to finding the best medical transcription training for YOU! The absolute best medical transcription training for you will be the one that will best prepare you to become a successful medical transcriptionist. To help you on your quest to find your best medical transcription school, this site was put together with information on what to look for in a quality medical transcription training course. Work from HOME!- The majority of medical transcriptionists work from home. Growing industry- 8% growth in medical transcription jobs by 2022 according to the US Department of Labor. Flexibility- Set your own hours; work when you want to. Earn an income from home- average annual salary between $30,000 and $40,000. Stable healthcare industry- No matter what state the economy is in, people still require healthcare. Career ready in as little as 4 months- A profession that doesn?t require extensive training to enter the job market. Portability- A career that moves with you. Research Training- Find out what quality medical transcription training should include. Enroll- Choose a quality medical transcription school. Employment- Find companies that hire medical transcriptionists to work from home. An at home medical transcription career begins with quality medical transcription training.